Beautiful sterling silver green amber celtic brooch. Measures 40mm x 12mm. 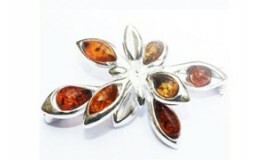 Sterling silver classic brooch with oval amber stone offering elegant and stunning look. Sterling silver brooch with two silver curves joined together with a central ball of amber. Amber brooch in a shape of a creepy crawly spider made from silver. Very effective look!